CB Harvey, a man with a PhD in videogame storytelling, recently took some time out to answer a few questions about his latest novella Dead Kelly. 1. 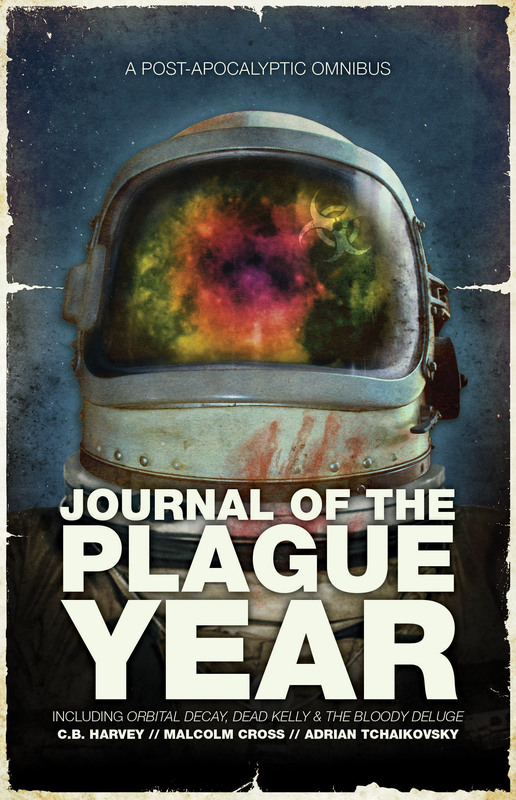 The Journal of the Plague Year is made up of newcomers to Abaddon – could you explain the process by which you came to publish with them and how the editors influenced your story, if at all? I’ve been a big fan of Abaddon for a long time. Dark and pulpy shared storyworlds are very much my thing. Some time ago Abaddon held (a highly unusual) open submissions round for new storyworlds and I seized my chance to pitch something to them. Although editor David Moore really liked my submission he liked another storyworld someone else had pitched a teensy bit more and had decided to go with that. However, I cheekily enquired as to whether, in that case, I could pitch to one of their existing lines..? Fortunately for me David said yes and the result is Dead Kelly. David was great at reining me in, particularly when I used seventeen words where one very pithy one would do just as well. But the plot and my menagerie of despicable characters remained untouched. 2. You’ve written in a few shared worlds, how was it entering into the Afterblight realm and what kind of research was necessary for your story to fit? By now I’ve written for a few different licenses in different media. Licensed media can be quite prescriptive in terms of the stories which are told – understandably enough, because someone’s effectively lending you their characters and storyworld and they want them back in pristine condition. At other times doing licensed work can be surprisingly flexible, depending on the property and the nature of the licensing arrangement. By contrast, the Afterblight stories aren’t licensed but there’s clearly a need to maintain consistency with what’s gone before. I made sure that there were some references to elements in other Afterblight stories, at least up until the point at which the Cull really took hold. At that point I thought, because of Australia’s distance from everywhere else, and having established points of commonality, I could go on my own merry way. That said, I changed a particular twist because it was starting to seem way too much like a twist in another of the previous Afterblight stories: in the end that was serendipitous because it allowed me to take part of the story in a completely different direction, a development I was very happy with. 3. I’ve described Dead Kelly as ‘Mad Max on steroids meets Ned Kelly on crack’ – it’s an harsh tale of revenge and power: what was the kernel behind its inception? When Abaddon originally put out their open submissions call I tried working up a ‘Weird Western’ idea set in late nineteenth century Australia. In the end I couldn’t quite get it to work so I instead pitched a completely different idea but Australia was clearly stuck in my head. Given that I’d only just moved back to London from Australia I guess that’s not surprising. I mean it’s the most extraordinary place in loads of ways and the environment seemed perfect for an Afterblight story. Given the globe-trotting nature of the Aferblight storyworld, it seemed a no-brainer to pitch a story set there. While in Australia I’d talked to some friends about Ned Kelly, a character I’d been interested in for a long time. What really fascinated me was the time period, the mythology around him, but most of all that utterly iconic look. I mean, the helmet and the armour has got that steampunk-style incongruity about it which I find really intriguing. I wanted my protagonist, Kelly McGuire, to steal that look and use it to build his own mythology. In addition, while I was growing up my older sister and eldest brother were both a bit obsessed by the Mad Max films (this is before Tina Turner got in on the act), so they’re part of my cultural DNA. Clashing Mad Max and Ned Kelly together seemed entirely logical, and I needed a high-adrenalin style to make it work (hopefully it has). 4. The setting in Australia was inspired – how did it come about and did it require research? The biggest influence was that I lived in Australia for eighteen months in an amazing place called Leura, which is just up from the Blue Mountains. My wife had been offered a job at the University of Western Sydney, so we moved ourselves and our kids from our cosy urban existence in South London to live in the mountains. It was a bit like ‘A Year in Provence’, only with snakes and spiders that can kill you. Dead Kelly still required a lot of research, mainly because although I’d been to Melbourne I hadn’t lived there and I didn’t know it brilliantly well. I spent a lot of time getting the flora and fauna of the area around Melbourne right, as well as the geography of the city. Then I stumbled on the amazing web of storm sewers that runs beneath the city and the people that explore them. I really wanted to include those sewers, but getting it right was a real challenge. 5. There is the idea and use of myth or legend, a cunning notion by your protagonist – could you explain this idea of myth as power in your story? The concept of a protagonist trying to create his own mythology emerged as the story developed, although looking back it’s clearly implicit in the idea – in the title Dead Kelly in fact. McGuire takes and wears Ned Kelly’s armour because he knows its impact, what it means to the people he’s trying to intimidate. Then he uses it to take revenge on the people he thinks betrayed him, and anyone who might be a threat. His ultimate goal is to build an empire, but also to ensure the survival of that empire and his legacy by any means possible. While I was writing Dead Kelly a certain high profile politician died. I became fascinated by the way this individual’s flag-bearers sought to control this person’s mythology, and to cancel out any competing narratives. In fact, this idea of control versus chance is really key to Dead Kelly. McGuire is determined to control events; I guess we all know, or have known, people like that (though hopefully they don’t go on murderous post-apocalyptic rampages wearing armour). 6. Your Bio is quite intimidating (a PhD in videogame storytelling) and extensive, from comics to academia – how do all these forms of narrative, as different yet similar as they are, inform each other in your work? Well, like lots of writers I augment the millions I earn from writing with a paltry academic salary. I teach and research what’s called ‘transmedia’, which is storytelling across media. I’ve always been interested in different kinds of storytelling, whether it’s books, comics, films, videogames, television, you name it, and the relationships between different kinds of stories. But it’s quite hard to find jobs where they’ll pay you to talk about this stuff. Academia affords me a way of doing it which is socially acceptable (or I like to pretend it does, at least. I may be delusional). That said, the academic stuff doesn’t really cross over much into my fiction. I can’t actually think of anything guaranteed to kill a story quicker than difficult academic theory. And yes, I’m looking at you, The Matrix franchise. 7. How do you think you would fare in the apocalyptic wastelands and what strengths or skills do you possess to help you survive? In the event of an apocalypse, I am not likely to be of any use to anyone, except possibly as a meal. Or maybe a mascot. I’ve often joked that I should carry a tag reading ‘No User Serviceable Parts’. My wife, she’d be fine. She’d whittle the family a three-bedroom house, no problem. And probably a Blu-Ray player. But she’d have me for breakfast. Literally. 8. What can we expect from you next – any more Cull stories currently being drafted? The next thing of mine to appear will be a completely different kind of pulp novel for a small American publisher, set in a very familiar storyworld. In the meantime, I have something else I’m working on, which again will be very different. I was looking for some fantasy to read and ended up trying to decide between Jon Sprunk’s Blood and Iron or Anna Thayer’s The Traitor’s Heir. Both had an interesting synopsis and nice cover art (I know, never judge a book by its cover but we all do..). In the end I decided to give Thayer’s debut a go. Check out the blurb. Like many from his village, young Eamon Goodhand dreamed of joining the Gauntlet, the army of the overlord Eldered. Now he is about to complete his training and swear his loyalty to Eldered and his commanders, the Hands, who uphold Eldered s tight control of the land. Entering into the service of the Gauntlet, Eamon’s gifts, particularly his potent Sight, quickly become valuable to his superiors and he advances to the command rank at a speed that arouses the suspicions of fellow officers. However, Eldered’s bloody rule, and Eamon s personal friendships, start to challenge the young soldier’s assumptions about what might be true, and worthy of service. And soon Eamon must conceal a fatal secret: he is sworn to both Eldered and to Hughan, the rightful king of the land. Yet he may not forswear the vows he has uttered in all good faith so however he serves, his name will be traitor. As tensions and military skirmishes increase, Eamon finds himself trusted by both his masters. How can he possibly maintain his integrity, act justly to his fellow officers of the Gauntlet, and act on behalf of all the warring people of the land? Whilst my tastes run a little to the darker side when it comes to sci-fi and fantasy, I’m glad I read The Traitor’s Heir . Anna Thayer writes and lectures on C.S. Lewis and J.R.R. Tolkien and the influence is there to see. Her debut is a classical fantasy as good battles evil, characterised respectively by the guerrilla force of the true King and the dominating and ruling power of the Master. Like Tolkien and Lewis, a number of similar allegories can be construed in Thayer’s work: the good/King is concerned with freedom, honour and truth whilst the evil/Master is all about power, lust and servitude. Though the novel may trace a classical lineage back to the likes of Tolkien, it is by no means an imitation. Thayer has created a well constructed world with an interesting magical system. Her writing is, maybe, less direct than some of the big names in fantasy right now but her story is no less gripping. Populated with a number of well defined characters, it is through the protagonist, the eponymous Traitor’s Heir that the author deserves the most praise. He is in turns the most frustrating and despicable yet relatable of her actors, taking on an almost schizophrenic nature as his treachery sways between his pledge to the Master and his allegiance to the King. 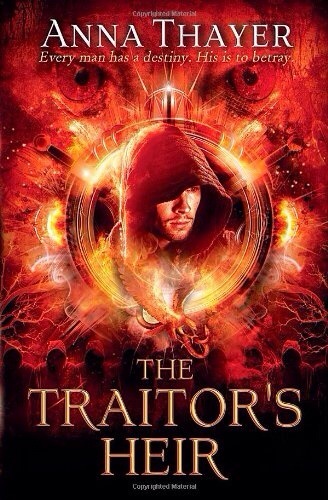 The first book in a trilogy, The Traitor’s Heir is clearly setting the stage for some much larger conflicts. In the first instalment we see Eamon Goodman entangled in his desire to serve the Master and become aligned with his fierce power, fulfilling his destiny whilst simultaneously trying to be loyal to his friends and his free will. It’s a clever turn by Thayer to have her lead work and spy for both sides, making him an unlikeable ‘hero’ and an unlikely person to base the trilogy upon in some respects. I have the second book in the series already and I’m invested enough to want to know how Thayer will redeem her protagonist. There’s a number of interesting threads to this world, from its own history to the system of magic and the aligned forces that face each other. It might not be all blood and guts but it was intriguing, engaging and engrossing. Gollancz sent out this press release today which has all the makings of an epic genre based festival. Check out the details below..
Gollancz, the science-fiction and fantasy imprint of the Orion Publishing Group, and Waterstones Piccadilly are delighted to announce plans to host an interactive multi-media genre fiction festival with participation from Patrick Rothfuss, Joanne M. Harris, Joe Hill and many more bestselling genre writers. Midway between genre-fiction convention Nine Worlds GeekFest (Heathrow, 8-9th August) and The 72nd World Science-Fiction Convention (Loncon 3, ExCel London Docklands, 14-18th August), Gollancz will celebrate their galaxy of remarkable authors by presenting science-fiction and fantasy fans with an unique multi-media fiction festival. 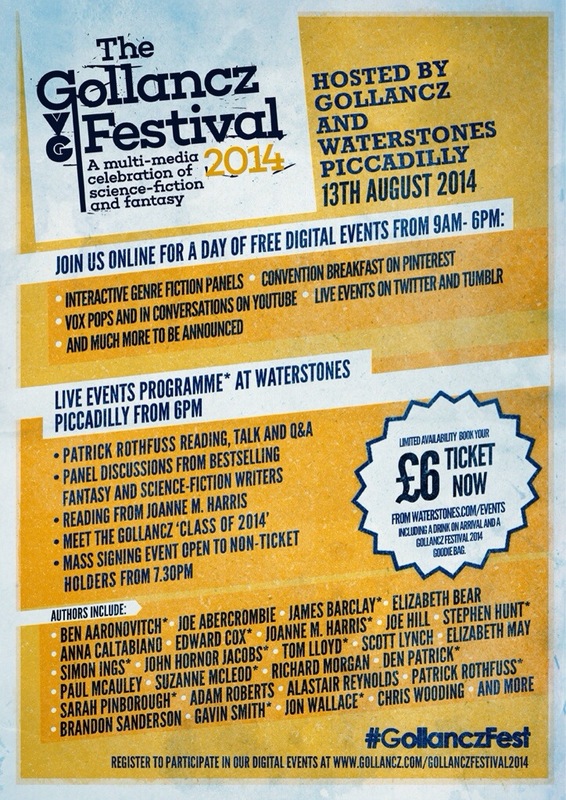 On Wednesday 13th August 2014, Gollancz will host a creative programme of daytime digital author events, and from 6 – 9pm on the same evening they will also offer genre fiction readers the chance to attend a selection of unique panels, readings, Q&As and signings all hosted by retail partner Waterstones Piccadilly. Simultaneously using the two largest event spaces in the Waterstones Piccadilly store, the Gollancz Festival 2014 will include a solo talk by NAME OF THE WIND author Patrick Rothfuss, and a reading by GOSPEL OF LOKI author Joanne M. Harris. There will be the chance to meet Gollancz’s talented 2014 debut novelists (our ‘Class of 2014’) and to participate in a spectacular selection of panel discussions with a brilliant range of Gollancz authors touching on hot genre topics. The festival will be an excellent occasion for science-fiction and fantasy fans from around the country to meet their favourite writers travelling to the UK in August, and all for the inclusive price of £6 (£4 for Waterstones loyalty card holders)! Attendees will also receive a drink on arrival and a Gollancz Festival 2014 goody bag. A mass signing beginning at 7.30pm, immediately after the panel events, will be open to non-ticket holders and those unable to travel to London can pre-order signed stock directly from Waterstones Piccadilly. With their series of interactive author events across a diversity of social media channels, Gollancz hopes to attract genre fiction readers from both across the UK and around the world! Starting at 9am with author breakfast tips featured on a Pinterest board, the digital elements of the Gollancz Festival 2014 will include interactive genre panels; Vox Pops and in conversations on YouTube; live debates on Twitter and Tumblr, and much more. For full details of the Waterstones evening event, to purchase tickets or to pre-order a signed book visit http://www.waterstones.com/events or call 020 7851 2400. For updates on digital events please register your interest at http://www.gollancz.co.uk/gollanczfestival2014 and follow @gollancz #gollanczfest. The Gollancz festival will include physical and digital participation from Ben Aaronovitch, Joe Abercrombie, James Barclay, Elizabeth Bear, Anna Caltabiano, Edward Cox, Joanne Harris, Joe Hill, Stephen Hunt, Simon Ings, John Hornor Jacobs, Tom Lloyd, Scott Lynch, Paul McAuley, Elizabeth May, Suzanne McLeod, Richard Morgan, Den Patrick, Sarah Pinborough, Adam Roberts, Alastair Reynolds, Patrick Rothfuss, Brandon Sanderson, Gavin Smith, Jon Wallace, Chris Wooding and more. After Malcolm Cross’ fantastic Orbital Decay, I couldn’t help but read the second novella in Journal of the Plague Year. But, where Cross’ story was full of claustrophobic darkness and creeping isolation in space, the next instalment was as different as could be. Harvey’s take on the Afterblight is all sun bleached-parched Earth and brutal, full throttle action. It’s a story that doesn’t let go as it powers forward into ever increasing violence. Set in Australia, mere months after the outbreak of the disease that has destroyed the planet’s population, the action focuses on Kelly McGuire. A former gang boss and violent criminal who went on the run just before the ‘Cull’ struck. Whilst he made good his escape from the police in the outback, the apocalypse took Australia and left it in ruins and a chance encounter, that ends badly for the poor souls who run into McGuire, sets him on a path back toward his old haunts and a chance at vengeance. The story follows McGuire as he goes from encounter to violent encounter, his history slowly revealed and his total amoral attitude and desire for control pushed to the fore. But, that’s not to say this protagonist is stupid. Far from it. He quickly appraises the situation and realises what he has to do to be the top dog once again. Using an old Australian legend that is Ned Kelly’s armour, found in a museum, coupled with his own legendary status as Dead Kelly, the criminal, McGuire uses violence and mythic symbols as motivating reasons for his position of power. This is the essence of Harvey’s text, it’s about control and power whether that is found by using mythic symbols, such as religion or legend, or through violence, condoned or otherwise. But, it is also about legend (and violence) as legacy – not just what those symbols stood for in the past; instead what will they mean for the future. This is McGuire’s real journey. 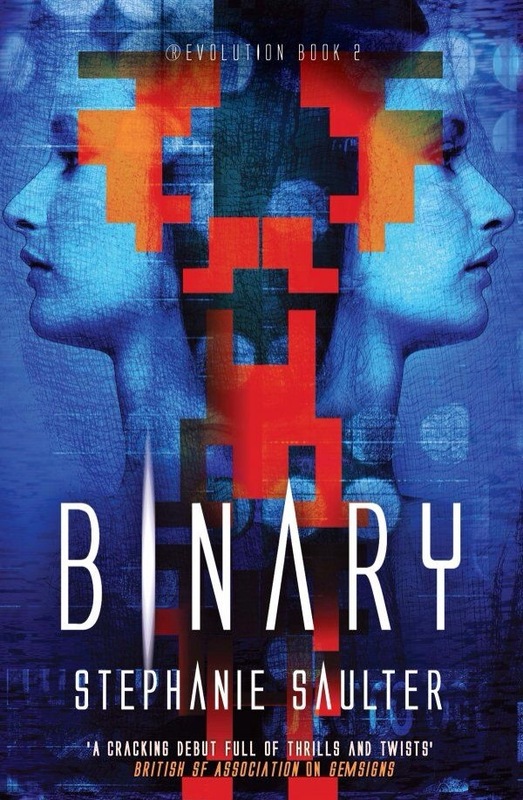 CB Harvey’s story has some great twists and turns at the end, things that both explain and conclude the novella brilliantly. On its way there, though, it is an adrenaline fuelled, barn-burner of a read. Populated by tough, brutal characters and the madness of hope and crushing reality in the face of absolute desolation, Harvey’s tale reads like a mix between Mad Max on steroids and the historical legend of Ned Kelly on crack. It’s energetic, exciting and extreme in its take on the apocalypse because, in the end, violence and rage win out. If you’re looking for a rush, Dead Kelly will deliver. Stephanie Saulter very kindly took some time to answer a few questions about her work, the ideas behind it and what we can expect to see from her next. Hopefully, you’ll find it as interesting as I did. Gollancz, part of the Orion Publishing Group, sent out a press release today concerning the acquisition of the rights to a new space opera trilogy, penned by 27-year old, debuting author Thomas N. Toner. THE PROMISE OF THE CHILD is a space opera epic in the grandest tradition of Iain M. Banks’ Culture series or Asimov’s Foundation novels, written in a vivid prose reminiscent of David Mitchell. THE PROMISE OF THE CHILD is a stunning feat of imagination – set against the epic scope of that backdrop ranging from 14th-century Prague, to a lonely cove near the Mediterranean Sea, to the 147th-century Amaranthine Firmament, Toner crafts an intelligent space opera filled with gripping action and an emotional scale that is wonderfully intimate. The novel follows Lycaste, a lovesick recluse living in a forgotten Mediterranean cove who is renowned throughout the distorted people of the Old World for his beauty, and Sotiris Gianakos, a 12,000-year-old Cypriote grieving the loss of his sister, a principled man who will change Lycaste’s life forever. Their stories, and others, become darkly entwined when Aaron the Longlife – the Usurper, a man who is not quite a man – makes a claim to the Amaranthine throne that threatens to throw the delicate political balance of the known galaxy into ruin. The first novella in Journal of the Plague Year definitely gets things off to an impressive start. All three of the stories in this collection are set in Abaddon’s shared world Afterblight series where an apocalyptic virus has wiped out humanity, leaving only a tiny percentage of the world’s population – some crazy, some desperate but all trapped in the nightmare of survival. It’s a great setting and has produced some decent novels but Cross’ effort to tell the beginning of the story is noteworthy. Set on the International Space Station, six characters witness the beginning of the end in perfect isolation as they orbit the Earth. From the first seemingly innocuous reports of a new strain of bird flu, to the horrifying realisation that it is actually a deadly man made virus, the astronauts struggle with the fact of being safe but utterly powerless to help. Stranded two hundred and fifty miles away from the surface, with little chance to communicate to family and friends, things begin to go sour very quickly as tensions rise and arguments boil over. From the outset, Cross really makes the reader feel immersed in the gravity-free wonder of a space station. Yet, very quickly, that wonder is turned up side down as the protagonist discovers that one of his duties involves an experiment that is suspiciously similar to the virus ravaging Earth. Suddenly, the silence and isolation of the space station becomes a claustrophobic warren as trust and friendship is tested, questioned and, finally, destroyed. It is a microcosm of madness created to tell the narrative of the virus, brilliantly handled by Cross. The writing is controlled whilst the scientific discussions are extremely realistic, giving the whole novella a very believable and very scary feel. However, it is the sense of dread, slowly constructed by dark airlocks, whirring oxygen fans and radio static that drives the story, making it such a fantastic read. I’ve come across numerous recommendations for Armor, many of them stating that it was underrated, perhaps even a little obscure. Yet, all offering up praise for its bold and unique take on military science fiction ideas and great story. I’m going to wholeheartedly agree with the latter of those statements. 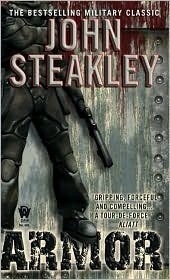 To me, John Steakley’s novel is a must read if you enjoy science fiction with a military emphasis. Who doesn’t like their fiction filled with power armour, space aliens and brutal warfare? Published in 1984, the book, however retains a poignant and very modern message regarding the futility and horror of battle. Rather than glorifying combat, Steakley reveals the terror and desperation, the adrenaline and addiction, and the all consuming cost that war can have on the human psyche. It is also a gripping and brilliantly conceived book that hooked me from the outset. Told from two perspectives, the first quarter of the book follows Felix, a new Fleet recruit in the Antwar, who is suddenly thrust into battle. Unprepared and against all odds he survives – again and again as he fights massive, mindless ‘ant’ monsters on the planet Banshee. The dislocating fear, coupled with his need to survive brings into being ‘the engine’; his coping mechanism and his other self. A self that is cold and murderous. We are then introduced to Jack Crow, a space pirate fleeing prison. His story takes him to the planet Sanction, where he becomes embroiled in the politics and machinations of a pirate intent on taking the planet for his own, destroying the Fleet science base and removing the owner, a drunk named Lewis. The ruse Crow employs to get himself into the science base is an old set of power armour that he offers to the director of the base. That armour turns out to have been owned by Felix and the rest of his story is then told through the eyes of Crow and the scientist as they watch his battles, his injuries, his descent into the hell that is Banshee as ‘the engine’ takes over. It’s a powerful tool to explain the horror that is war but also the mindlessness of the bureaucracy that runs it. They literally watch the craziness unfold and we see how it affects them, even at such a remove. Eventually, we are returned to the perspective of Felix and certain motives are explained though I’m not going to say more for fear of spoiling the novel. The writing style reminded me of Jack Kerouac or JD Salinger at times with it’s flowing inner dialogue. But it is the driving, relentlessness of both the main characters that forces the book along at a a staggering pace. Each protagonist exudes toughness but also an internal brokenness about them. Steakley captures it so well, forcing the characters to be both leaders and warriors whilst simultaneously questioning and reflecting on their situations. In short, it’s a furious story about war, insectile aliens and pirates. In truth, it’s about the human psyche, motivations and morality. It came highly recommended and now I can pay it forward.